KunZum.com invites all to the book launch of Ajay Jain’s new travel book, Peep Peep Don’t Sleep by noted photographer and author Amit Pasricha. 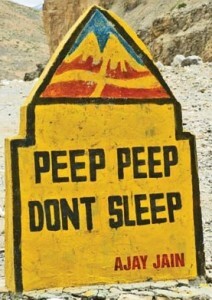 A collection of funny road signs and ads, Peep Peep Don’t Sleep was put together by Ajay Jain after driving over 10,000 km on Indian highways. Adding to the humour is some of his own commentary to go with each sign.